NYAC presents the International Judo Banquet. After a day of intense Judo competition, please join us for our annual Judo Banquet and enjoy dinner, drinks, and socializing with the some of our Olympians, i.e. 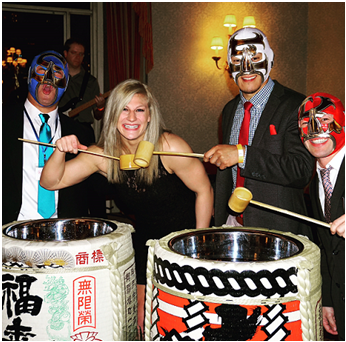 Kayla Harrison and Travis Stevens, the competing teams, the coaches, and the Sakeman! Sake is provided by the Sakeman! All sake is imported from Japan and is of the highest quality to match the quality of judo demonstrated at the tournament! Sakeman are ambassadors of sake and want to help spread happiness through sake! 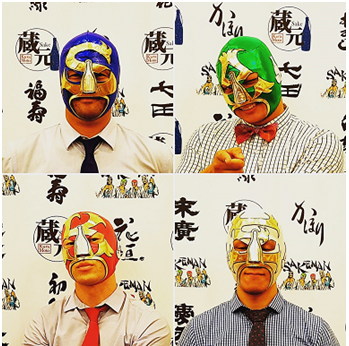 Also, every member of the Sakeman team are black belts in Judo and you may recognize the man under the white mask. Banquet will start shortly after the tournament's closing ceremonies. It is a tradition at our annual International Judo Banquet to perform Kagami-Biraki. More information on this Japanese tradition below.